Douglas Horne applied an exclamation point to an already spectacular season Sunday with a pair of national records and a double-up victory in the Jim McClure Nitro Nationals presented by the Carolina Harley-Davidson Dealers Association at Rockingham Dragway. 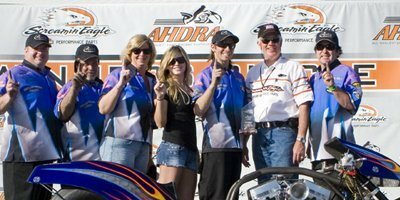 Horne swept the Top Fuel and Pro Fuel titles for the third time this season, set the All-Harley Drag Racing Association speed record at a thundering 233.68 miles per hour and the Pro Fuel record for quarter mile time at 6.502, eclipsing the 6.514 standard he himself set en route to victory at Rockingham in last May’s Spring Nitro Nationals. A total of 12 AHDRA performance records were established in the event, which commemorates the career of the late Jim McClure, a former AHDRA winner at Rockingham and a member of the Harley-Davidson Hall of Fame. Horne, the 23-year-old phenom from Aberdeen, Md., won his 13th and 14th races in a season in which he almost doubled the points totals of his primary rivals in both the Top Fuel and Pro Fuel categories. Although he never before had won Top Fuel at The Rock, his Pro Fuel win was his fourth straight. Horne, who also has been successful in the NHRA Pro Stock Motorcycle Series where he was runner-up three times on the way to a fifth place finish in 2009, beat Tommy Grimes of Pfafftown in the Top Fuel final and Randal Andras of Amelia, LA. for the Pro Fuel purse. Grimes, riding the Raleigh-based bike of Harley legend Ray Price, lowered the Top Fuel record from 6.224 to 6.215 seconds with a booming second round victory over Robert Stewart of Gloucester, VA., but he suffered a mechanical failure against Horne that denied him any shot at his second victory this season. Other pro winners included Shaun Reno of Hayes, VA., in Pro Stock; Mark Cox of Wilkesboro, N.C., in Pro Drag; Keith Browne of Semora, N.C., in Pro Gas; and Jason Adams of Gainesville, GA., in Pro Modified. Among the Sportsman winners were Bruce Croneberger III of Cressona, PA., who doubled-up in Right Quick Street Pro and Hot Street; Chris Hoppe of Pennington, N.J., in Super Gas, Donnie Huffman of Lakeland, FL., in Super Sport; Kevin Winters of Richmond, IL., in Super Eliminator; K.W. Seneca of Irving, N.Y., in Screamin’ Eagle SEP; Nick Gonatas Jr. of Youngstown, Ohio, in Screamin’ Eagle Destroyer; and Derek Christensen of Hellam, PA., in ET. Horne, who crashed his bike at 200 mph and missed six races during the 2009 season, won his eighth tour event in Top Fuel and 18th in Pro Fuel since he first burst onto the scene at age 19. En route to the Top Fuel title, he beat veteran former champion Jay Turner of Julian, N.C., in the semifinals. His four round series was the quickest in history at 6.261, 6.222, 6.296 and 6.291 seconds. Qualifying – 1. Tommy Grimes, Pfafftown, N.C., 6.217, 223.88 mph; 2. Douglas Horne, Aberdeen, MD., 6.242, 229.94 mph; 3. Joey Sternotti, Blackwood, N.J., 6.256, 232.43 mph; 4. Randal Andras, Amelia, LA., 6.258, 224.47 mph; 5. Steve Dorn, Milwaukie, OR., 6.347, 226.70 mph; 6. Tracy Kile, Leicester, N.C., 6.419, 207.27 mph; 7. Damian Cownden, Victoria, British Columbia, Canada, 6.478, 219.29 mph; 8. Takeshi Shigematsu, Iyo, Ehime, Japan, 6.494, 217.60 mph. Round 1 – Robert Stewart, Gloucester, VA., 6.398, 224.24 mph, def. Takeshi Shigematsu, Iyo, Ehime, Japan, 9.166, 98.75 mph; Larry “Drums” Brancaccio, Nutley, N.J., 7.804, 210.11 mph, def. Randal Andras, Amelia, LA., 7.956, 204.32 mph; Steve Dorn, Milwaukie, OR., 6.318, 225.86 mph, def. Russell Sowers, Hermitage, PA., no time; Douglas Horne, Aberdeen, MD., 6.261, 232.59 mph, def. Chuck Jones, St. Petersburg, FL., 15.199, 60.08 mph; Damian Cowndon, Victoria, British Columbia, Canada, 6.643, 191.51 mph, def. Armon Furr, Orangeburg, S.C., 6.854, 203.06 mph; Jay Turner, Julian, N.C., 6.372, 216.72 mph, def. Joey Sternotti, Blackwood, N.J., 6.558, 222.99 mph; Tracy Kile, Leicester, N.C., 6.473, 202.73 mph, def. Jason Pridemore, Garrettsville, Ohio, 7.804, 140.23 mph; Tommy Grimes, Pfafftown, N.C., 6.249, 219.40 mph, def. Larry Stanley, Copley, Ohio, 7.737, 170.97 mph. Round 2 – Grimes, 6.215, 222.88 mph, def. Stewart, no time; Dorn, 6.369, 225.90 mph, def. Brancaccio, 6.491, 181.91 mph; Horne, 6.222, 227.80 mph, def. Cownden, 7.406, 148.07 mph; Turner, 6.284, 222.14 mph, def. Kile, 6.511, 210.87 mph. Semifinals – Grimes, 6.286, 221.96 mph, def. Dorn, 10.108, 98.57 mph; Horne, 6.296, 230.92 mph, def. Turner, 17.149, 63.17 mph. FINAL – Douglas Horne, Aberdeen, Md., 6.291, 233.68 mph, def. Tommy Grimes, Pfafftown, N.C., no time. Qualifying – 1. Douglas Horne, Aberdeen, MD., 6.527, 216.86 mph; 2. Randal Andras, Amelia, LA., 6.610, 197.54 mph; 3. Rickey House, Humble, Texas, 6.656, 204.54 mph; 4. Bill Purvis, Lafayette, LA., 6.976, 189.15 mph. Round 1 – Dean Comunal, Stroudsburg, PA., 6.870, 200.53 mph, def. Bill Purvis, Lafayette, LA., 8.920, 100.82 mph; Randal Andras, Amelia, LA., 6.548, 210.14 mph, def. Greg Grove, Shelbyville, Tenn., 6.906, 182.08 mph; Rickey House, Humble, Texas, 10.041, 91.64 mph, def. Jack Romine, Centreville, Mich., no time; Douglas Horne, Aberdeen, MD., 6.502, 206.51 mph, def. Chris Streeter, Cleveland, Ohio, 6.616, 199.94 mph. Semifinals – Horne, 6.679, 194.27 mph, def. Comunal, 6.819, 202.88 mph; Andras, 9.281, 94.41 mph, def. House, foul. FINAL – Douglas Horne, Aberdeen, MD., 6.584, 212.36 mph, def. Randal Andras, Amelia, LA., 6.732, 207.27 mph. Semifinals – K.W. Seneca, Irving, N.Y., 8.614, 156.96 mph, def. John Marinelli, DeBary, FL., foul; Shaun Reno, Hayes, VA., bye. FINAL – Shaun Reno, Hayes, VA., 8.039, 166.83 mph, def. K.W. Seneca, Irving, N.Y., 8.765, 149.43 mph. Round 2 – Mark Cox, Wilkesboro, N.C., 7.277, 173.81 mph, def. Johnny Vickers, Millers Creek, N.C., 7.739, 164.95 mph; Rocky Jackson, Youngsville, LA., 7.276, 165.54 mph, def. Bill Purvis, Lafayette, LA., 7.392, 168.64 mph; Kirby Apathy, Bloomington, IN., 7.204, 188.25 mph, def. Dale Nilles, Westminster, CO., 7.513, 166.23 mph; Steve Pier, Hatfield, PA., 7.423, 165.66 mph, def. Craig Pelrine, Redwater, Alberta, Canada, foul. Semifinals – Cox, 7.098, 175.21 mph, def. Jackson, 9.402, 97.70 mph; Pier, 7.234, 172.50 mph, def. Apathy, 7.286, 181.13 mph. FINAL – Mark Cox, Wilkesboro, N.C., 7.223, 174.14 mph, def. Steve Pier, Hatfield, PA., 7.532, 160.63 mph. Round 1 – Joey Sternotti, Blackwood, N.J., 7.310, 175.16 mph, def. Lee Hitz, Annville, PA., 8.713, 152.66 mph; Jay Wagner, Warsaw, IN., 7.465, 177.28 mph, def. Clint Riley, Greenville, FL., 8.462, 162.27 mph; Keith Browne, Semora, N.C., 6.983, 198.35 mph, def. Keith Williams, Myrtle Beach, S.C., 12.325, 70.06 mph. Semifinals – Sternotti, 7.212, 180.62 mph, def. Wagner, 7.459, 178.90 mph; Browne, bye. FINAL – Keith Browne, Semora, N.C., 7.170, 189.23 mph, def. Joey Sternotti, Blackwood, N.J., 7.426, 174.89 mph. Round 1 – Hank Stanton, East Rochester, N.Y., 8.482, 154.94 mph, def. Donald “Keith” Riddell, Taylor Mill, KY., 8.498, 159.49 mph; Frank Capone, Wakefield, MA., 8.602, 155.69 mph, def. Billy Joe Bowman, Philadelphia, PA., 9.043, 147.63 mph; Jason Adams, Gainesville, GA., 8.405, 161.65 mph, def. Gary Douglass, Staunton, VA., 8.770, 148.51 mph; Bruce Croneberger III, Cressona, PA., 8.420, 153.67 mph, def. Bruce Chandler, Irving, N.Y., 8.516, 256.08 MPH; Joey Thomson, Hopewell, N.J., 8.463, 155.42 mph, def. John Price Emmitsburg, MD., no time. Semifinals – Croneberger, 12.052, 86.01 mph, def. Thomson, foul; Adams, 8.397, 158.61 mph, def. Stanton, foul. FINAL – Jason Adams, Gainesville, GA., 8.417, 160.79 mph, def. Bruce Croneberger III, Cressona, PA., foul. RIGHT QUICK STREET PRO – Bruce Croneberger III, Cressona, PA., def. Charley Douglass, Staunton, VA.
BISON RACING/VREELAND’S HARLEY DAVIDSON SUPER GAS – Chris Hoppe, Pennington, N.J., def. Scott Kirkpatrick, New Ellenton, S.C.
AHDRA SUPER SPORT – Donnie Huffman, Lakeland, FL., def. Brad Croneberger, Valley View, PA. RUSH SUPER ELIMINATOR – Kevin Winters, Richmond, IL., def. Rebel Glover, Holly Hill, FL. SCREAMIN’ EAGLE SEP – K.W. Seneca, Irving, N.Y., def. Jim Sweet, Osceola, IN. SCREAMIN’ EAGLE V-ROD DESTROYER – Nick Gonatas Jr., Youngstown, Ohio, def. Brian MacAlister, Yorkville, Ohio. SCREAMIN’ EAGLE V-ROD – Derek Christensen, Hellam, PA., def. Robert Pettit, Bristol, IN. SYN 3 ET – Derek Christensen, Hellam, PA., def. Toni Blevins, West Point, VA.
PURVIS MOTOR SPORTS HOT STREET – Bruce Croneberger III, Cressona, PA., def. Charley Douglass, Staunton, VA.
SCREAMIN’ EAGLE DRAGGIN BAGGER – Phillip Johns, Layfayette, IN.